Glove up and get in the UROlympics arena! Knock out fellow fearless contenders during the ultimate endoscopic test, the UROlympics! This exciting second edition will take place during the fast-approaching EAU19 congress in the picturesque and electric Barcelona. Get ready to compete with opponents who hail from various countries across the world. Show off your endoscopic skills, beat the clock, and take your place as a deserving UROlympian. The first step is to pick up your ticket at the Cook Medical booth. The ticket is non-transferable; it is yours and yours alone. And voilà! You are officially a contender! Walk further into the EAU19 exhibition area where you will find the UROlympics arena, where the endoscopy combat will happen. Starting from Saturday, 16 March you will have the great opportunity to set your score during endoscopic tasks provided. Throughout the day, the time of the quickest contender will be displayed around the arena, at the Cook Medical booth and announced via social media. At the end of the day, the fastest contender will be proclaimed the most skilled. This means that you have more opportunities to showcase your skills and win prizes. The UROlympics winners will be honoured during the medal ceremony at the Cook Medical booth. Aside from the coveted UROlympics titles, medals and bragging rights, the winners will receive educational funds that they can use for EAU events (e.g. travel, accommodation and registration). The first UROlympics was held during last year’s EAU congress in Copenhagen. 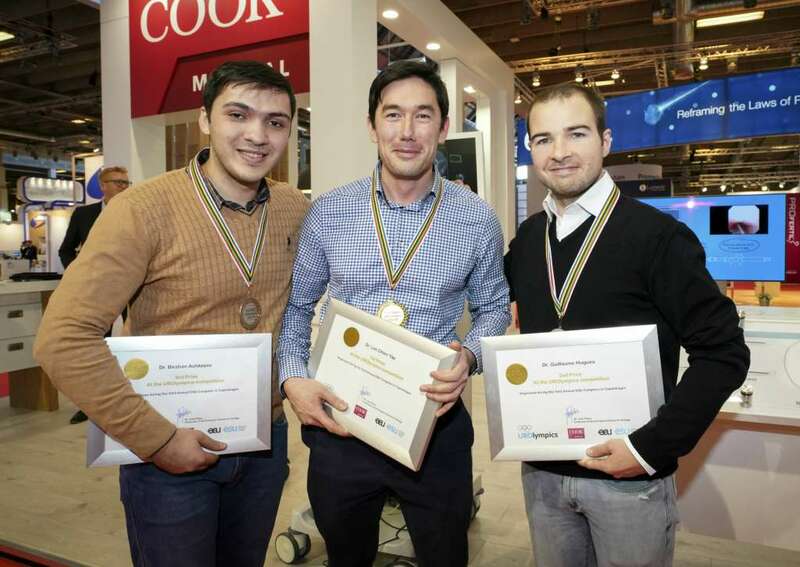 The riveting competition came to a close when Dr. Lee Chien Yap (IE) bagged first place, followed by Dr. Guillaume Hugues (FR) in second, and Dr. Birzhan Ashkeyev (KZ) in third. The UROlympians were honoured during the medal ceremony at the Cook Medical booth. (From left) Previous winners and first UROlympians Drs. Ashkeyev, Yap and Hugues. You, too, will have the opportunity to be a proud UROlympian! Glove up and get in the UROlympics arena!